The newest update for League of Angels – Fire Raiders is now available! 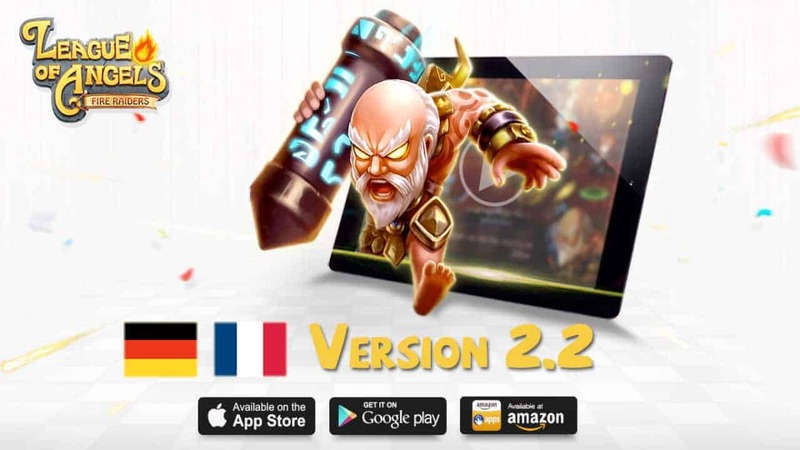 Version 2.2 adds a number of improvements and new content to the game. In order to bring the Fire Raiders experience to an even wider audience, French and German language options are now available. Players can choose these language settings from the menu once they have updated to the new version. Additionally, localization to other languages is still in the works. GTArcade is committed in making Fire Raiders more accessible to players from all corners of the world. The social experience is an important part of Fire Raiders and a new Friend System has been added to let players stay connected. This feature has been heavily requested by the fans and now its here! Players will now be able to add others to their Friends list, as well as communicate with friends using the chat interface. Discuss your favorite Angels and Heroes, Arena strategies, or who is the best at Fire Raiders! 	League level cap increased from 85 to 90. 	New Map Chapters added. 	Heroes can now be enhanced to Legendary (orange) quality. 	Various bug fixes and more. This update is another step towards making League of Angels – Fire Raiders the best mobile experience across the globe. Have you tried Fire Raiders yet? Download now and play for free!